One of the things our customers love the most about Riskalyze is how simple and easy it is to use. 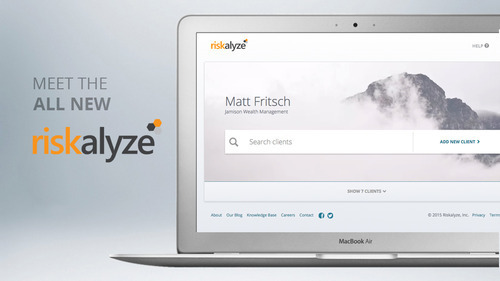 Today, we’re doubling down on that with the launch of an all-new Riskalyze dashboard and client profile, the Advisor-Set Risk Number and simpler stress tests. We don’t redesign things just for the sake of redesigning them, but there are two reasons we’ll undertake that task. One, if we can deliver a simpler, more delightful way for you to get your work done every day. And two, if those changes can lay the groundwork for the next generation of amazing innovations on our roadmap. Here’s a quick rundown of what’s new in Riskalyze as of today. The New Dashboard and Client Profile. An all-new dashboard makes it simple to find, sort and filter your clients. And we’ve delivered the feature most requested by all of you: client names are hidden by default when you arrive at the dashboard. They’re just a click or tap away. Advisor-Set Risk Number. Maybe it’s an existing client, or the kind of client who really won’t answer questionnaires. Or perhaps your broker-dealer dictates which risk tolerance questionnaire you use. Either way, it’s now simple for you to set the client’s Risk Number and proceed to building their portfolio to match. Customizable Risk Questionnaire Emails. Another often-requested feature…it’s now possible to customize the email you send to your clients requesting they capture their Risk Number. Model Portfolio Groups. Have a set of models you use for tax-advantaged accounts, small accounts, or large accounts? Put models into groups and it’ll be simple to find the right fit for the right client in each situation. Simpler, More Intuitive Stress Tests. We stripped away some of the detail around stress tests to create a simple, Risk Number-focused illustration of estimated performance during historical markets. Show a client how their 46 portfolio might have fared compared to the 82 portfolio that is the S&P 500 index. We hope you love these changes, but we’re still looking forward to your feedback and ideas. If you’re already a Riskalyze customer, this upgrade is live in your account. If you’re interested in learning more, join a guided tour or give our team a call at 1-855-RISKALYZE.